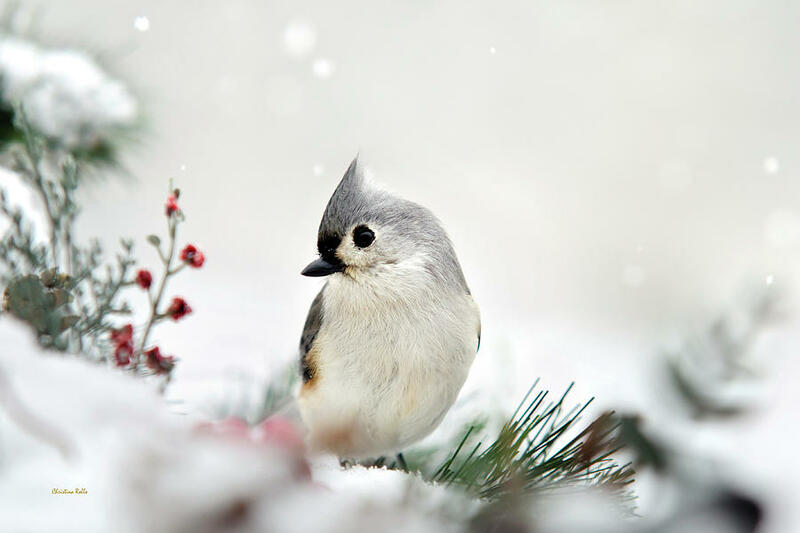 Photographing birds in the winter time can be easy and fun. 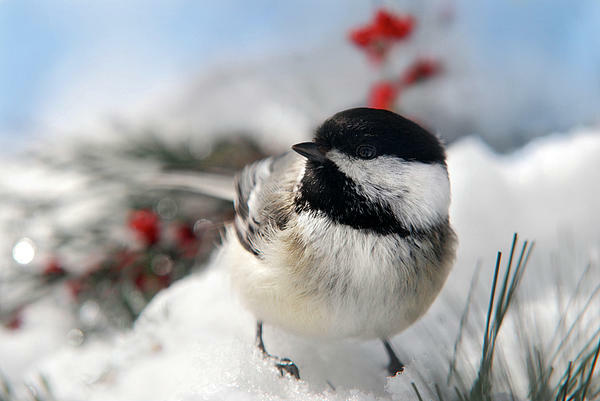 Here are some helpful tips for winter bird photography. First, bring the birds to you. Each year I decorate our front porch with pine garland, berries, pine cones, and perches for the birds. I hang a window feeder, fill it with black oil sunflower, and wait for the birds to come. To photograph birds through a window you need to put your lens as close and flat as possible to the glass, in order to avoid reflection. Notice which direction the light is coming from and try to use it to your advantage. Be patient, the birds can see your movements. They may get startled and fly away at first. Over time they’ll get used to your presence and pose for you. Get creative with decorations and perches. 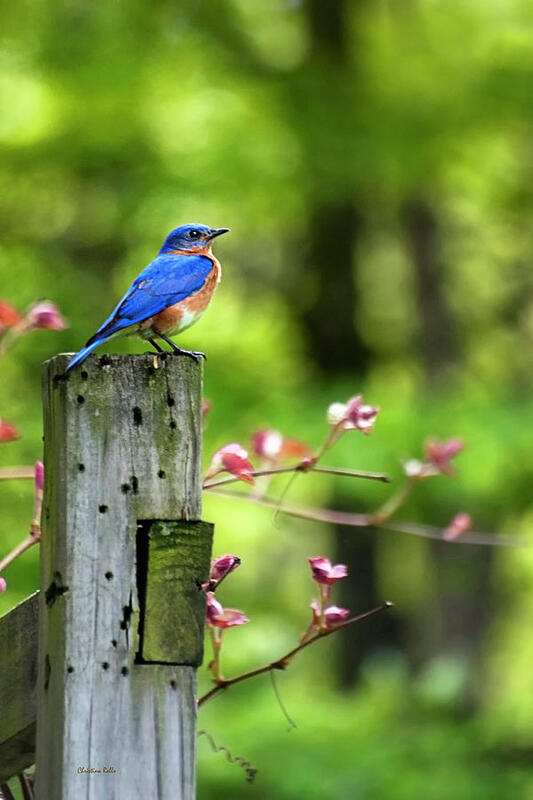 You can sprinkle some bird seed inside bird houses or decorative containers, enticing the birds to land where you want to photograph them. 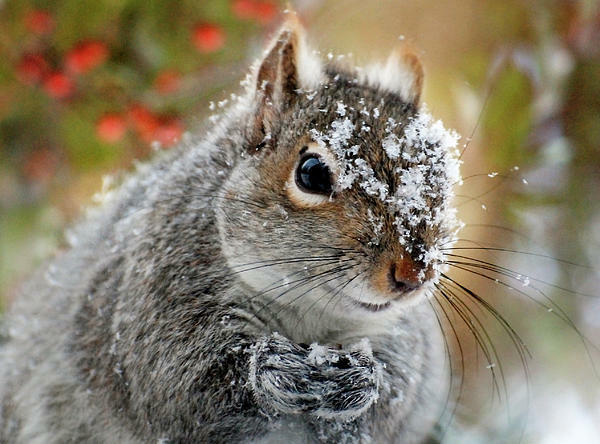 Be aware that anytime you feed the birds you may also be attracting unwanted guests such as raccoons, squirrels, chipmunks, and mice. 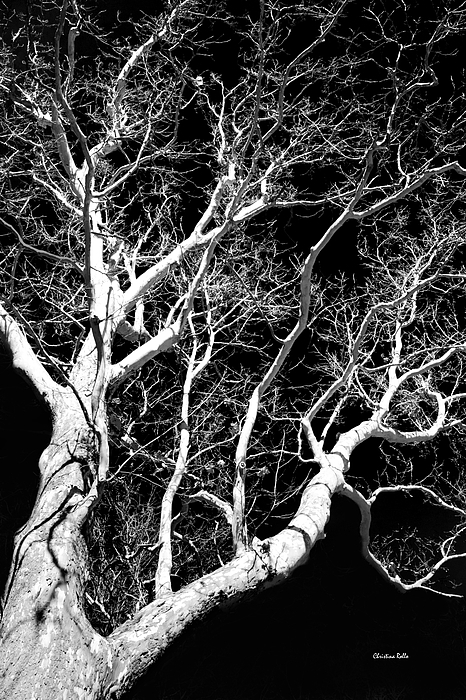 There are lots of ways to make photography work for you in winter without shivering to the bone. 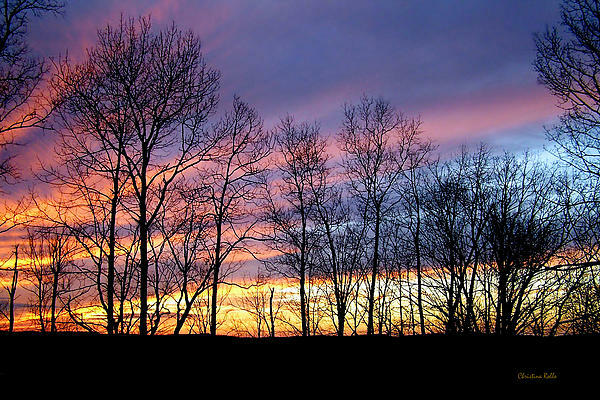 Enjoy nature, be creative, and have fun! Search: nature, animals, cardinal, red, avian, chickadee, wildlife, outdoors, mammals, snow, winter, squirrel, framed art, rollosphotos. 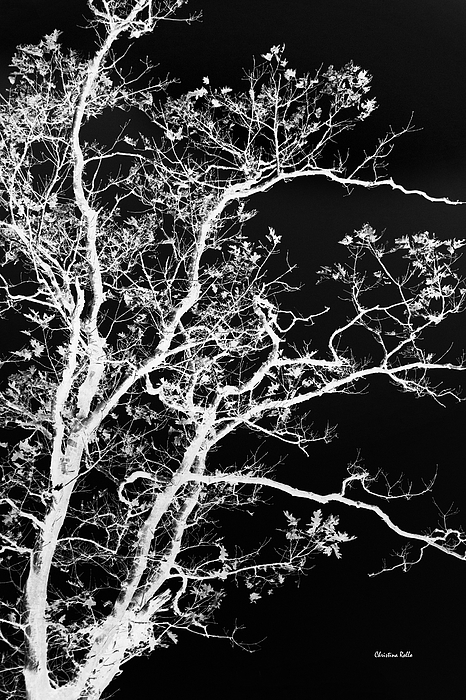 I never know what I’ll photograph when I wake up in the morning, I follow my heart and whatever mood strikes me. On one of the last hot days in fall, I decided to photograph some of the numerous bridges in my hometown of Binghamton New York. 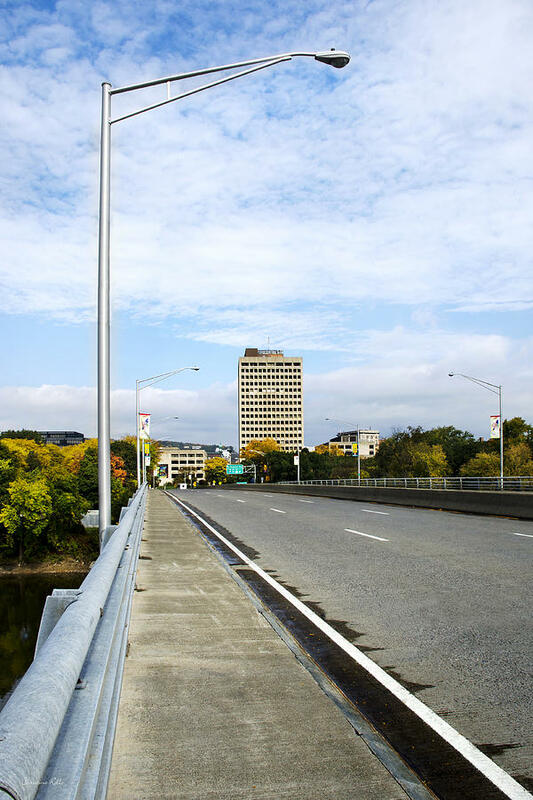 I began at the location of the old Rock Bottom bridge which isn’t there anymore, and enjoyed a nice long walk from the south side of Binghamton all the way to downtown. 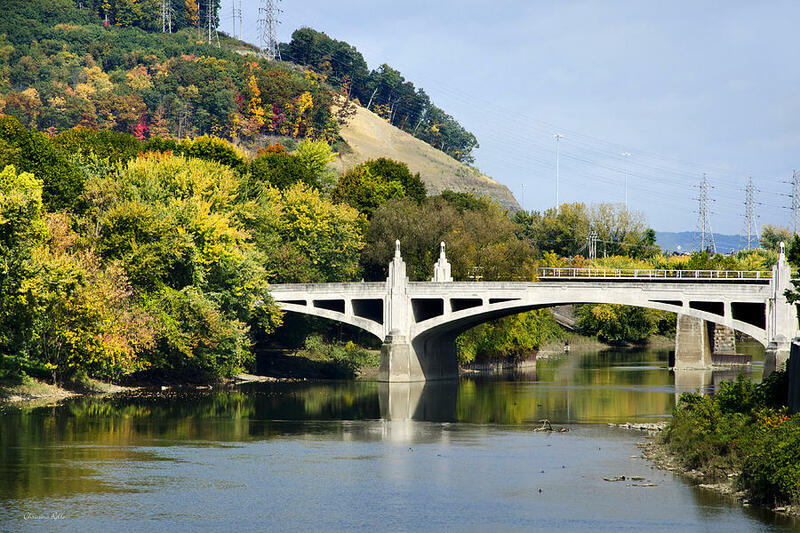 The city of Binghamton is located where two rivers meet in the middle of a long narrow valley. The north branch of the Susquehanna river runs through downtown. 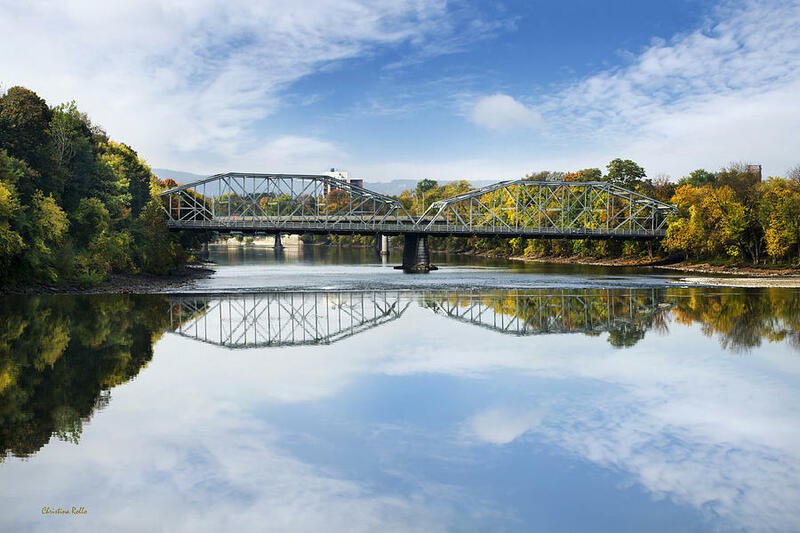 From downtown the Chenango river feeds into the Susquehanna river, and eleven bridges cross the rivers within our city. Here’s a beautiful view of the Exchange St. Bridge and Rock Bottom dam with colorful fall foliage along the Susquehanna river. This is the State St. Bridge which crosses over the Susquehanna river and enters the city from the south side of town. 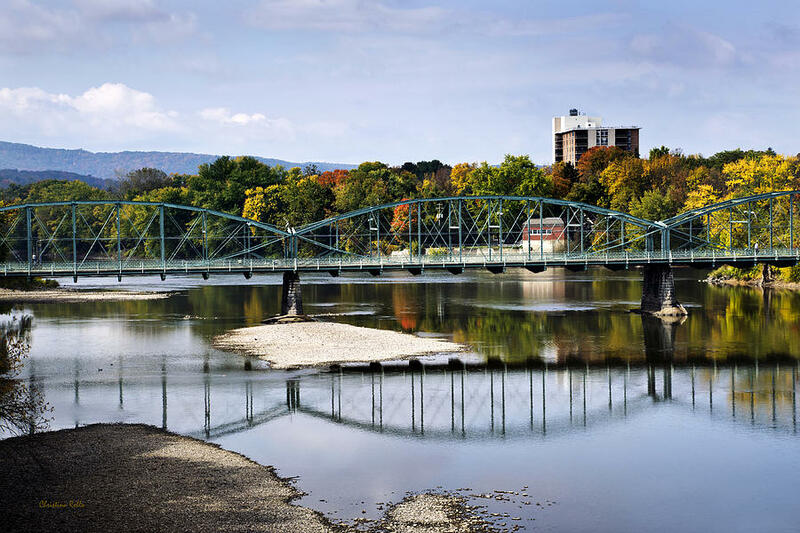 Here’s a scenic view of the South Washington St. Bridge with fall foliage along the Susquehanna river in downtown Binghamton, New York. The South Washington Street Bridge is a historic lenticular truss bridge. 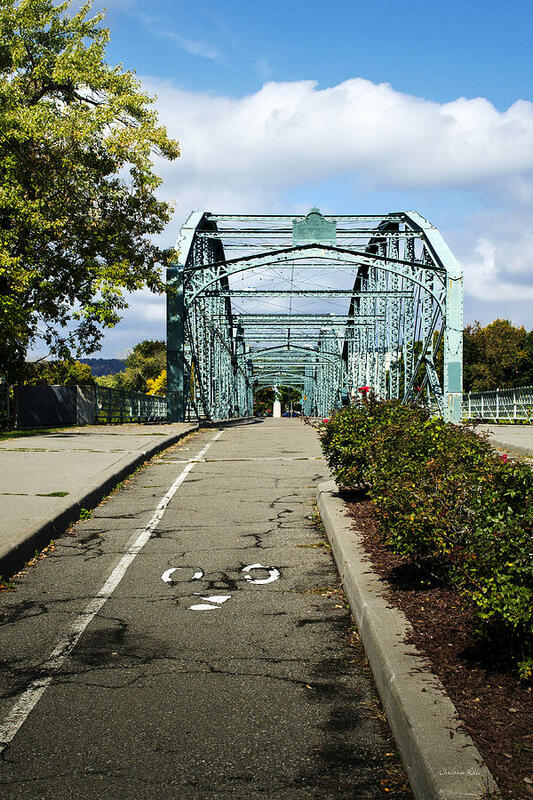 Constructed in 1866, this bridge connects the Binghamton’s south side to downtown. The bridge was closed to vehicle traffic in 1969, but remains open to pedestrians. Colorful autumn reflection on the Susquehanna river near the Memorial St. Bridge which connects downtown to the west side of Binghamton. 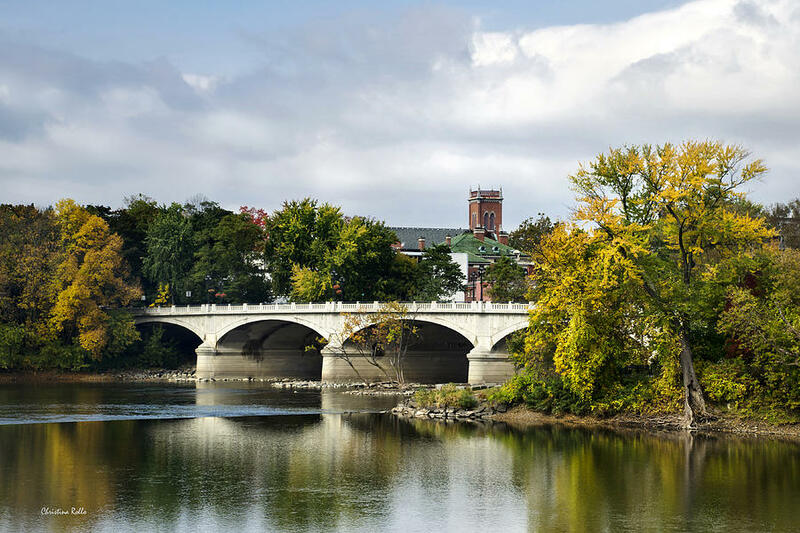 Confluence Park is located in downtown Binghamton New York at the South Washington St. Bridge, where the Susquehanna and Chenango rivers meet. 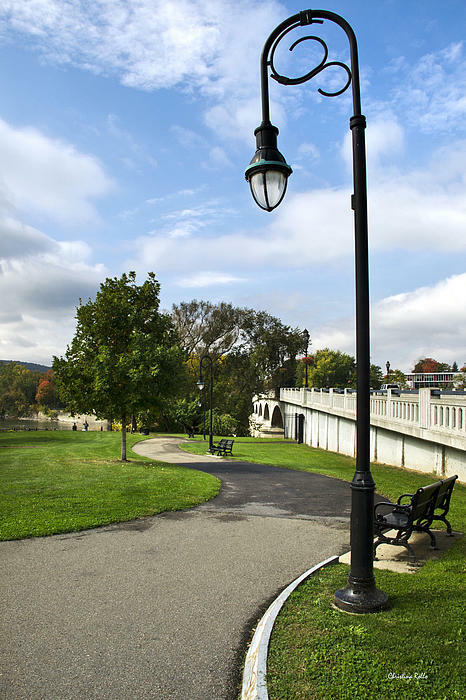 This scenic walkway will lead you through the city, east along the Chenango River. Finally, a scenic view of fall colors on the hillside at Prospect Mountain with the Court St. Bridge and Chenango river from downtown Binghamton New York. I hope you enjoyed your walk with me through my hometown! 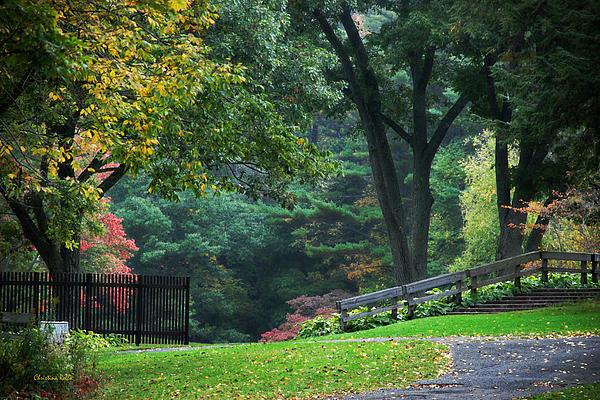 Enjoy more landscapes and bridges from my entire collection of fine art photography at www.rollosphotos.com. Search: bridge, scenic, river, landscape, binghamton, new york, autumn, fall, outdoors, scenery, reflection, bridges art, environment, framed art, rollosphotos. The male Northern Cardinal is always the first bird to visit our feeder in the morning and the last bird to visit at night. The Northern Cardinal is a medium sized North American songbird, common to backyard feeders. 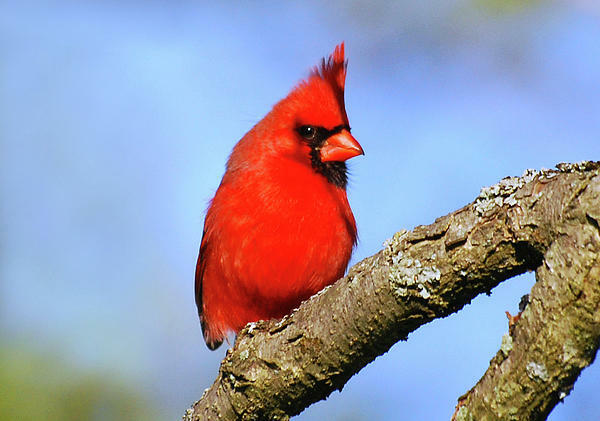 The male Cardinal is one of the most beautiful year-round birds we have in the Northeastern United States. 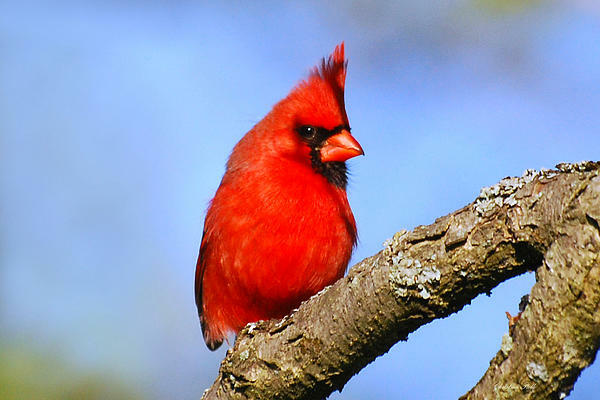 He is especially charming with his bright red feathers, black face mask, and distinct crest on top of his head. Cardinal pairs mate for life and stay together all year. During courtship, males can be observed feeding seeds to their mate. 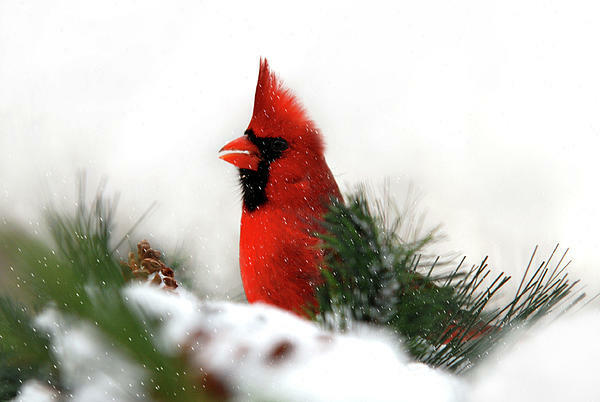 Here’s a beautiful male Northern Cardinal with bright red feathers sitting in snow covered pines. The male’s bright red plumage against a dismal gray or white landscape makes them a favorite species of winter birds. 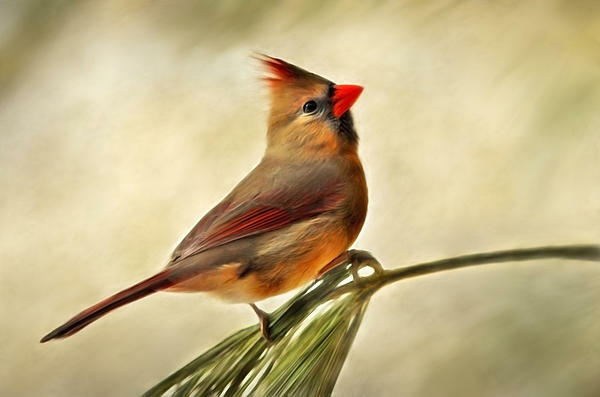 The female Cardinal is equally charming with an orange crest on top of her head, but her color is a dull buff brown. This female is the center of attention perched on a pine branch against a beige background. Northern Cardinals can be found in brushy areas, thickets, woodland edges, and suburban yards throughout the eastern United States. 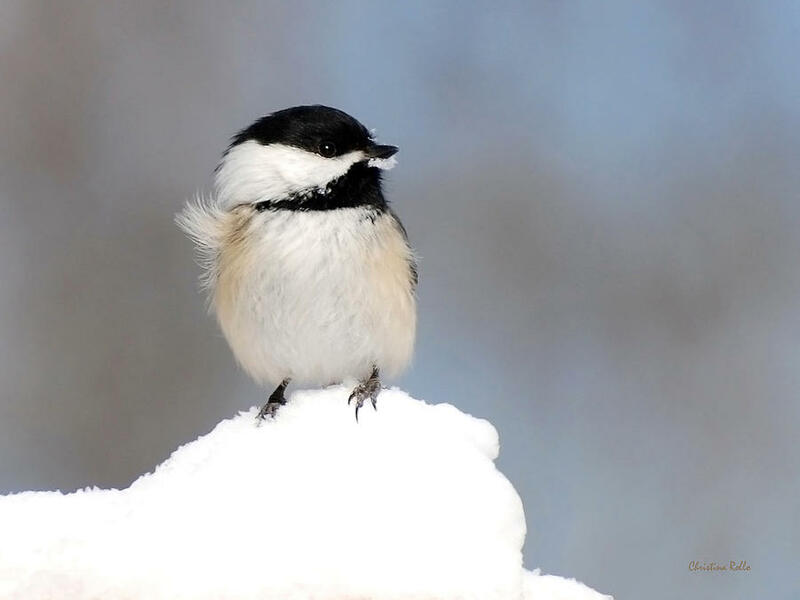 Their range has been expanding north for decades as a result of backyard bird feeders, which makes it possible for these beautiful birds to endure our harsh northern winter. Males are territorial and mark their territory with song. 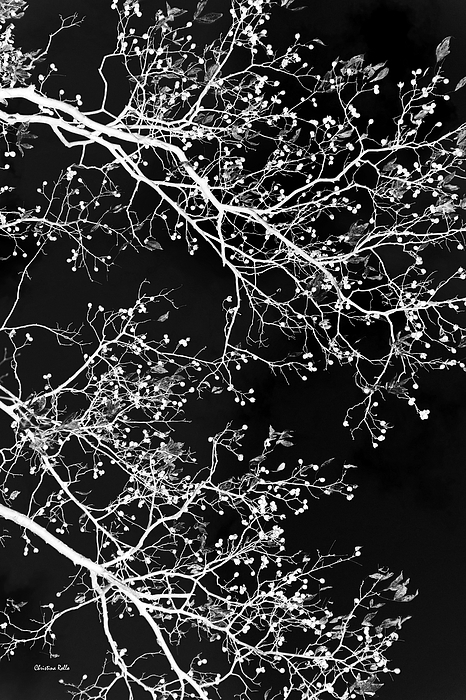 Nests are built in dense shrubs or small trees between 1 and 15 feet above ground. They are made from twigs, bark strips, vines, leaves, rootlets, and paper lined with grass and hair. The Northern Cardinal is the state bird, of Illinois, Indiana, Kentucky, North Carolina, Ohio, Virginia and West Virginia in the US. Search: nature, animals, birds, cardinal, red, avian, wildlife, outdoors, framed art, rollosphotos.